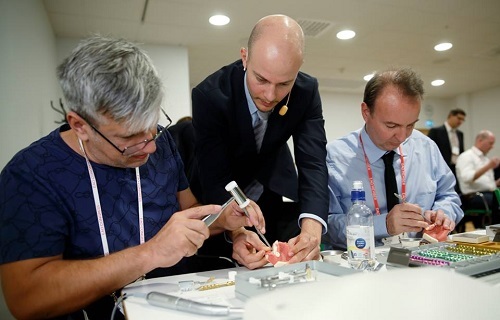 Update in advanced implantology and augmentation techniques in Wiesloch Germany. In practice, you will learn the surgical procedure for augmentative procedures. Using live operations, video demonstrations and practical exercises at the animal preparation, you will learn the different augmentation techniques.In addition, theoretical knowledge are taught, alternative methods are discussed and the avoidance of complications as well as the handling of these are presented. See current course dates below! Hands-on group assignment based on first come first served basis. Full day fee including lecture, workshop and lunch. To register for the workshop, lecture registration is mandatory. Registration will be confirmed upon receipt of payment on a first come first served basis. Cancellation fee is 400 € for 1-day events and 800 € for 2-day events. Bookings can be cancelled until forty five (45) days prior to each program. After that date, there will be no refunds. EBA Systems GmbH may cancel scheduled courses up to thirty (30) days prior to the scheduled start of the course if certain attendance minimums are not met. travel costs for a training course, schedule and purchase airfare and hotel accommodations with this in mind. By registering for the course, you agree that visual material from the course may be used for promotional purposes. An objection is possible by separate written notification to the BBA Academy. The internationally popular speaker »Dr. Frank Zastrow is an expert in the field of implantology and oral surgery and has many years of experience in individual patient care. In practice, you will learn the surgical procedure for augmentative procedures. Using live operations, video demonstrations and practical exercises at the animal preparation, you will learn the different augmentation techniques.In addition, theoretical knowledge are taught, alternative methods are discussed and the avoidance of complications as well as the handling of these are presented.